Really? Has anyone out there ever tried this? I found a picture on the internet, but have never made it myself. 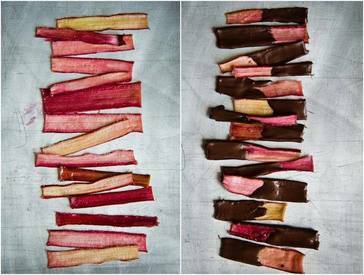 I love chocolate on anything, but rhubarb? I guess if you like sweet and sour together it just might be a hit. I like to think that maybe I could make a strawberry rhubarb pie and then maybe layer some yummy chocolate all over the top. What do you think? Oh- Happy National Strawberry Rhubarb Pie Day!